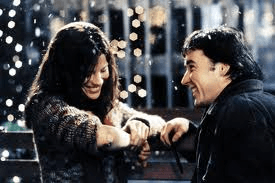 They say the meaning of serendipity is ‘a happy accident’, or ‘the gift of finding valuable things not sought for’ or even ‘a somewhat lame movie starring Kate Beckinsale and the adorable John Cusack’. But for us, it was just pure delight! Back in July, after the barn demolition, I headed south to Georgia to go to the merchandise mart in Atlanta to stock the store with new goodies. Chantelle stayed behind to begin and oversee the construction of the store. Now let me just explain something up front…Chantelle and I are stalkers. Not the creepy kind hiding outside your bedroom window in the bushes, just the kind where we constantly text, call and track each other down ALL DAY. It’s a skill, what can I say? You can hide but chances are, we will find you. 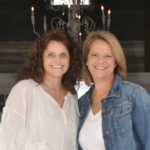 Any hoo, it’s no big deal for us to be updating each other every 4 seconds, so when I received the initial text of “holy crap! guess what we found!” it was not alarming. We had each been sending the other texts like this throughout the day and we get excited about a lot of stuff. But then I received a picture and I am pretty sure I yelped a loud “woo hoo!” right there on the trade show floor! When the work began at the store, task number one was removing the baseboards to prepare the floor for our amazing barn wood. 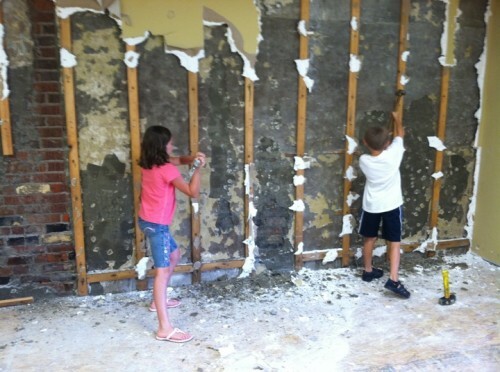 Upon pulling off some of the baseboard trim, they discovered some mold (this isn’t the exciting part). Of course, one thing always leads to another, and our 10 minute demo was turning into a two week redo as they removed the damaged walls. And that’s when it happened, our happy accident! 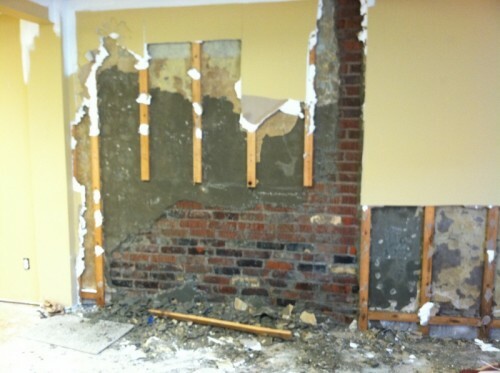 Chantelle discovered an old brick wall behind the drywall! Talk about literally hitting a brick wall! Woo hoo! Now speaking for myself, I can’t say I’ve done everything always right in my life and I’m pretty sure Chantelle might have a few flaws too, but can I just say that it felt like the stars were aligning! What ever did we do to deserve this good luck streak (don’t hate us yet, cause the pendulum always swings the other way so there will be more stories later where you can laugh at us!)? I even thought, “maybe we should go buy a lotto ticket today” but I obviously didn’t since we are still here and not in the Caribbean. 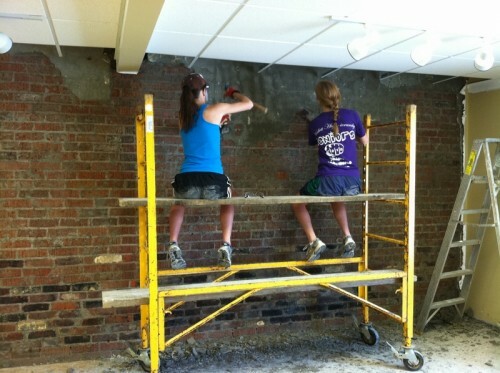 But winning lotto ticket aside, a brick wall was just the thing on our wish list for the future, and now we had one! Wait, what? There’s child labor laws? This took some serious dedication…but we conquered it! I might be making this sound too easy and yet, it was not! A crew of people chipped away at concrete, washed and scrubbed the brick with wire brushes for weeks, and popped Advil like candy since the work entailed something akin to jackhammering concrete on the highway. But for some reason children always think, “hey, that looks fun!” and they even joined in. 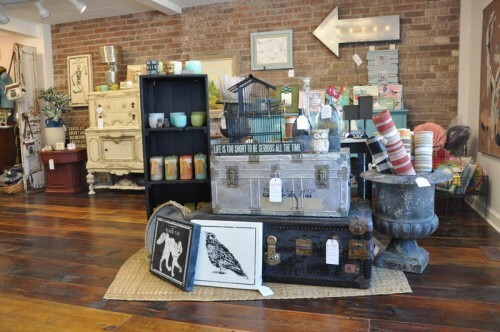 Before we knew it, we had a beautiful wall of exposed raw brick that is now a focal point as you enter the store. And I must say, it’s the perfect view! Maybe even better than if John Cusack greeted you himself as you came in. Well…it’s a really close second!